I found some pork ribs in the freezer. I don’t know how long they’d been there. This could have ended in tears. Regardless I made a lovely Chinese style throwtogether meal. I’m still alive so obviously the pork was OK and the little symbol inside my freezer informing me how long I can safely store meat in it was a complete waste of time. Add all the ingredients (except the pork and cornflour) to a large pan with 1/2 cup of warm water and stir well. Slowly bring to a boil. Meanwhile score the porks skin fairly deeply with a sharp knife at about 5cm intervals. Pop the pork into the sauce and coat with the mixture. Turn the heat to low so that the sauce gently simmers. Pop on the lid and cook for 1 hour stirring and turning every 15-20 minutes to baste the meat. Add the mushrooms and the remaining capsicum* and stir into the sauce. Simmer for 10 minutes, lid on. Remove the meat from the pan and turn up the heat. Mix the cornflour with a little water and when the sauce is simmering, stir in to thicken. Return the meat to the pan and remove from the heat. Check the sauce for flavour and add more sugar if necessary. 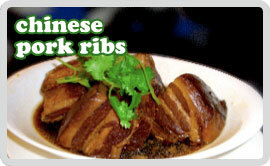 Pour the sauce over the ribs and serve with plain boiled rice and some chinese greens.